Avaaz - A "Petrolhead" as the next Climate Commissioner? A "Petrolhead" as the next Climate Commissioner? 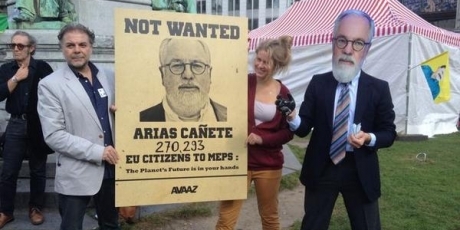 As concerned EU citizens, we call on you to show true climate leadership and make sure your political groups reject the appointment of Miguel Arias Cañete as the next Energy and Climate Change Commissioner. His deep ties to the oil industry and his appalling record as Spain’s environment minister make him unsuitable for the job, while creating a huge conflict of interest. Instead we urge you to find a strong leader committed both to putting the EU on the path towards a clean energy future and helping lead the world to a global climate deal in 2015. In hours a Spanish oil 'baron' could be chosen as our European Commissioner on Climate. And only we can stop this shocking appointment! It would be absurd to leave the leadership of Europe's energy policy and global climate talks to a man who The Sunday Times has named "Señor Petrolhead". But MEPs can reject the appointment and while some are threatening to accept him in return for political favours, with enough public backing, progressive MEPs could lead the charge to block him. Last week we created the largest march ever for 100% clean energy. Let's build on that momentum now and demand a strong climate leader for this crucial post. Public outrage has pushed MEPs to reject controversial candidates at the last minute before. It's up to us to do it again now -- Sign on the right to say NO to Arias Cañete and tell everyone -- our petition will be delivered directly to the MEPs.